This hotel is conveniently located on Jianguomen Avenue, in the Dongcheng District of Beijing. The hotel lies just 500 metres from the railway station, enjoying ease of access to other areas to be discovered. Guests will find themselves a mere 10 minutes' driving distance from the bustling city centre and Tiananmen Square. This expansive hotel is one of the largest in Beijing, and is sure to impress discerning business and leisure travellers alike. The hotel tempts guests into a world of luxury and refined elegance. The guest rooms are beautifully designed, offering a peaceful setting in which to work and rest in comfort. The hotel features an extensive array of exemplary facilities, ensuring impeccable service and meticulous attention to detail. Featured amenities include a business center, express check-in, and express check-out. Planning an event in Beijing? This hotel has 65014 square feet (6040 square meters) of space consisting of a conference center and a meeting room. A roundtrip airport shuttle is provided for a surcharge (available 24 hours), and self parking (subject to charges) is available onsite. Make yourself at home in one of the 730 air-conditioned rooms featuring LCD televisions. Complimentary wired and wireless Internet access is available. Private bathrooms with shower/tub combinations feature rainfall showerheads and complimentary toiletries. Conveniences include phones, as well as safes and desks. With a stay at Lake View Hotel in Beijing (Downtown Beijing), you'll be within a 15-minute drive of Wangfujing Street and Temple of Heaven. This 5-star hotel is 5.4 mi (8.7 km) from Sanlitun and 5.9 mi (9.5 km) from Tiananmen Square. With a stay at Beijing Marriott Hotel Northeast in Beijing (Chaoyang), you'll be within a 15-minute drive of Sanlitun and Yonghe Temple. 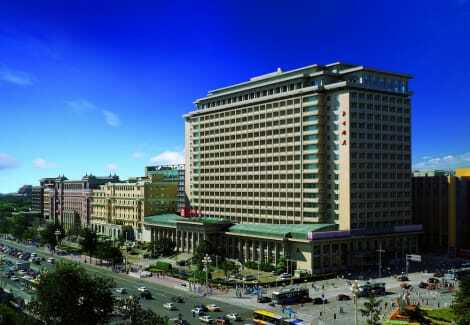 This 5-star hotel is 5 mi (8.1 km) from Wangfujing Street and 7.3 mi (11.7 km) from Tiananmen Square.